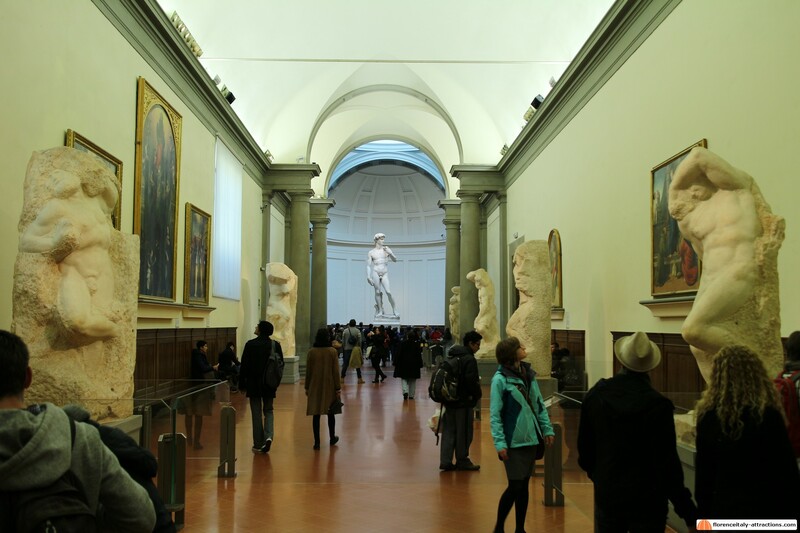 When my customers enter the Accademia Gallery in Florence and we reach the room dedicated to Michelangelo, I always spend some time explaining the famous Michelangelo Slaves. Often this effort is frustrated by people who look elsewhere, to the David statue, which acts like an irresistible magnet. I certainly understand but at the same time I’m frustrated knowing that they’re missing out on some real masterpieces. Michelangelo Slaves, also known as Michelangelo Prisoners, are four statues by Michelangelo whose popularity is mostly related to their unfinished state. As such, they represent a portion of the routine work of Michelangelo called non-finito (unfinished) which is a feature of many of his works. For scholars, the unfinished statues represent the complex relationship Michelangelo has with marble, serving as a symbol of his trouble not only in cutting a figure from a block of stone but also in revealing the soul from the matter. 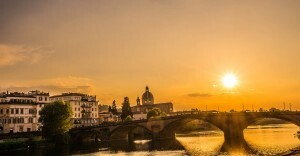 Now, until we speak about Michelangelo Slaves, there’s no mystery surrounding their unfinished state: they were commissioned by Pope Julius II to be part of his own tomb, but later the Pope changed his mind, asking Michelangelo to decorate the Sistine Chapel, and after his death the nephews of the Pope revised the project of the tomb in order to save money. This is the reason why Michelangelo left so many statues with a different unfinished state. 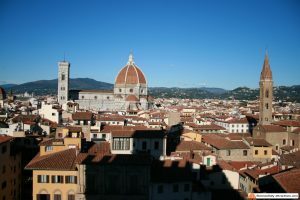 Along with Michelangelo Slaves at the Accademia Gallery, there is the statue of Victory in Palazzo Vecchio, and two more Slaves or Prisoners at the Louvre Museum in Paris. 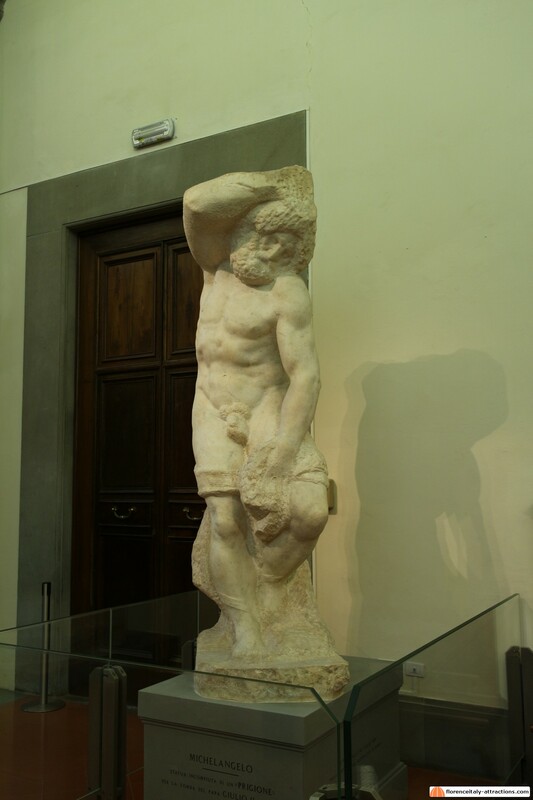 All the unfinished statues at the Accademia uncover Michelangelo’s methodology and idea of cutting. 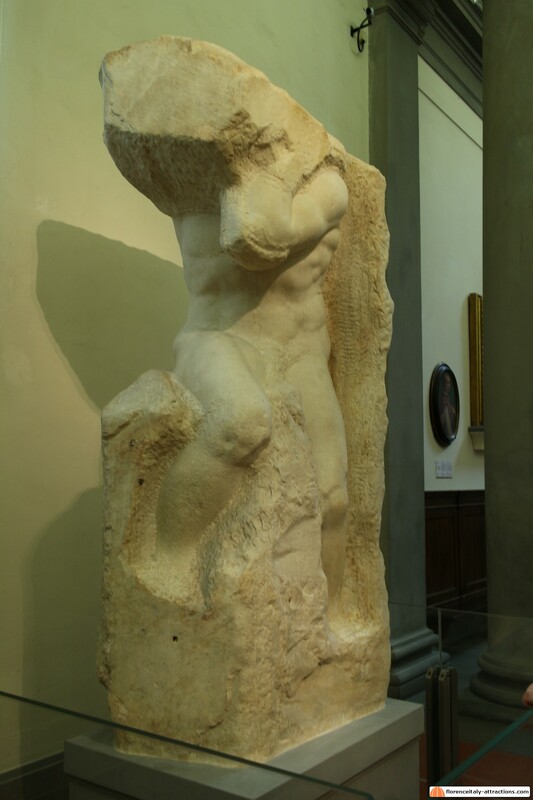 Michelangelo accepted the stone carver was an apparatus of God, not making yet basically uncovering the effective figures contained in the marble. As you appreciate the Prisoners from diverse points, one can recognize Michelangelo’s affection and comprehension of the human anatomy. Michelangelo Slaves are remaining with the vast majority of their weight on one foot so their shoulders and arms bend off-hub from the hips and legs. This exact posture gives the Prisoners a more dynamic and compelling appearance, transmitting movement and feeling. It’s a technique widely used in antiquity by Greek sculptors, called contrapposto. This piece is the most effective and expressive work among the Slaves. It is the first statue one on the left in this room. The figure feels like it is writhing and straining, attempting to burst out of the marble that holds it. Michelangelo is celebrated for saying that he attempted to free the soul caged in the marble. This perpetual battle of man to free himself from his physical requirements is an analogy of the body obstructing the spirit. On the other side of the room stands the Young Slave. This figure is the most characterized, however appears to be just about bound inside himself, covering his face in his left arm and concealing the right one around the hips. The contrapposto stance is truly misrepresented by the slenderness of the piece of stone and by the somewhat bowed knees. The significant investigation of human anatomy is highlighted in the left elbow and the watchful lines of the curved biceps and triceps. 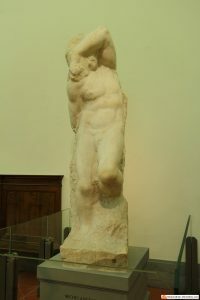 Michelangelo constantly etched out the picture front to back: it plainly shows in the Young Slave, which gives an impression of rising up out of the rock. Moving on closer to Michelangelo’s David, on the left, is the Bearded Slave the less unfinished of the four Slaves. The figure is pretty much free, just his hands and some piece of his arm, presumably meant to hold something, are unfinished. The face is secured by a beard and a cloth covers part of his legs. The chest is finely represented, showing once again Michelangelo’s knowledge of human anatomy. The last statue on the left before reaching Michelangelo’s David is called the Atlas, because of his position, remembering the mythological Atlas sustaining Earth. The man is undoubtedly carrying a tremendous weight on his head. 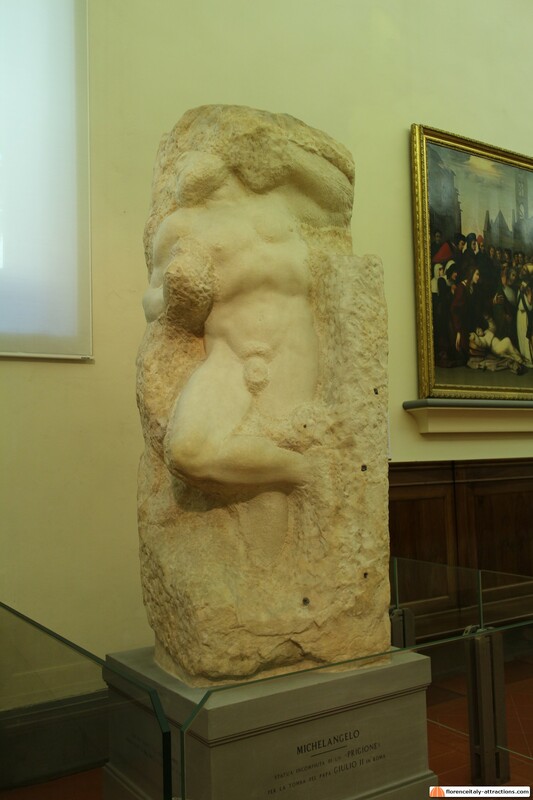 More than harmony, here Michelangelo is representing two contrasting forces (the stone pushing down and the body pushing up). Unlike the other slaves, fighting to free themselves up from the marble, this Slave is trying to rise up from the marble.